KATHMANDU: Tigers could become extinct in the wild in two decades unless the world ramps up conservation efforts to halt the decline in their population, wildlife experts said Wednesday. Barely 3,500 tigers are estimated to be roaming in the wild in 12 Asian countries and Russia compared with about 100,000 a century ago, experts and conservationists said. "Despite our efforts in the last three decades, tigers still face threats of survival. The primary threat is from poaching and habitat loss," Nepal's prime minister Madhav Kumar Nepal told a conference of tiger experts from 20 countries. Tigers are being illegally killed for their body parts and Asia is a hotspot for the illegal wildlife trade, which the international police organization Interpol estimates may be worth more than $20 billion a year. Skins sell as rugs and cloaks on the black market, where a skin can fetch up to $20,000. 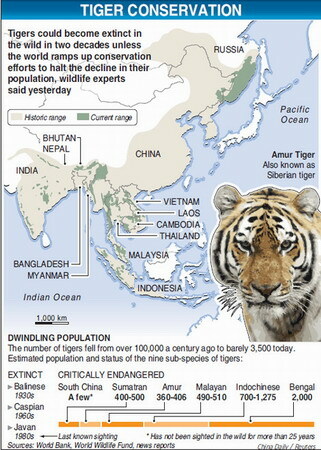 Habitat destruction and depletion of prey base are other perils facing the "Asian heritage", conservationists said. "A business as usual approach in tiger conservation will doom the tiger population in the next 15 to 20 years," Mahendra Shrestha, program director of the Washington-based Save the Tiger Fund said on the sidelines of a conference on tiger conservation. He said law enforcement, patrols to stop poaching and the preservation of remaining habitat would improve the situation. "There is hope. We can do it. It is not rocket science. It does not require a lot of new activities," Shrestha said. "But there has to be strong political will to conserve tigers and also strong global international support for the activities of the tiger range countries." Tigers still roam terrain in Bangladesh, Bhutan, Cambodia, China, India, Indonesia, Laos, Malaysia, Myanmar, Nepal, Russia, Thailand and Vietnam. John Seidensticker, chief scientist at the Smithsonian National Zoo's Conservation Ecology Center, said tiger habitat had declined by 40 percent in the last decade due to destruction of forests. 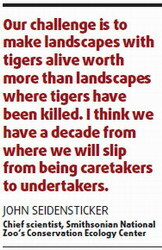 "Our challenge is to make landscapes with tigers alive worth more than landscapes where tigers have been killed," Seidensticker said. "I think we have a decade from where we will slip from being caretakers to undertakers."